The Nikon F-mount Sigma 18-35mm f/1.8 DC HSM Art Lens is a wide-angle to normal-length zoom that features a fast, bright constant f/1.8 maximum aperture. It is specifically designed for use with APS-C-sized sensors and provides a 35mm-equivalent focal length range of 27-52.5mm. The lens integrates four aspherical elements into its construction as well as five Special Low Dispersion (SLD) glass elements to help minimize various aberrations and distortions throughout the zoom range as well as provide greater image sharpness and clarity. A Super Multi-Layer Coating has also been applied to lens elements to reduce surface reflections, lens flare, and ghosting to produce images with higher contrast and color fidelity. The lens barrel design is constructed from a Thermally Stable Composite (TSC) material that is akin to metal in texture and resistance to temperature and environmental changes while also remaining lightweight and compact. An internal focusing and zooming mechanism also helps to maintain a compact and consistent overall length and non-rotating front ring also better enables the use of circular polarizing filters. For control of focus, a Hyper Sonic Motor (HSM) is used to ensure fast, precise, and quiet focusing capabilities that are well suited to continuous shooting and movie recording. For updating lens firmware and fine-tuning its nuances to best suit your personal shooting, this lens is compatible with the Sigma USB Dock. The dock allows you to specify certain parameters and other settings through the Sigma Optimization Pro software, such as AF speed and focusing limitations. This lens is part of Sigma's Art line; deeming it well-suited to creative image making due to its large, constant f/1.8 maximum aperture and ability to produce aesthetic bokeh by way of a nine-blade circular diaphragm. 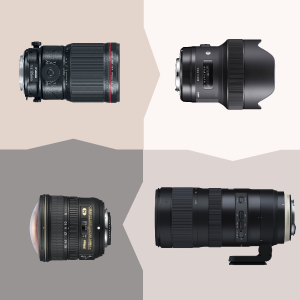 The range of focal lengths it covers, from wide-angle to normal-length, is nicely situated for everyday and artistic shooting applications. Four aspherical lens elements, as well as the incorporation of five SLD glass elements, help to minimize the appearance of distortions and aberrations throughout the zoom range and provide clear imagery with enhanced sharpness. A Super Multi-Layer Coating also benefits the image quality by reducing reflections and flare and contributing to greater overall contrast and fidelity. The Hyper Sonic Motor provides fast, quiet, and smooth auto focusing that is well-suited for use with video applications. This AF motor can also be manually overridden at any time by rotating the focusing ring, giving you the ability to fine-tune image sharpness through manual focusing. Constructed using a TSC compound material, this lens is lightweight while also exhibiting notable durability and resistance to environmental changes. An internal focusing and zooming mechanism helps to maintain a consistent overall lens length and a non-rotating front ring facilitates more efficient use of circular polarizers. Limited 3-Year U.S.A. Extended Warranty Extension Against Manufacturing and Workmanship Defects. Box Dimensions (LxWxH) 7.0 x 4.8 x 4.7"
18-35mm f/1.8 DC HSM Art Lens for Nikon F is rated 4.7 out of 5 by 528. Rated 5 out of 5 by Christopher from My new favorite lens! This is my first Sigma lens and I love it! The images are sharp and the lens is so much fun to shoot. Pros: Solid construction, heavy duty feel. The zoom and focus rings are extremely smooth to turn. Nice rubber grip adds to the solid feel. The lens never changes size, as you zoom or focus it all takes place internally. The images are very sharp. The button for auto/manual focus is nice and the included lens hood is great quality. Cons: This solid, rugged construction comes with a price, it is heavy, but manageable. In low light situations the autofocus does some hunting. Overall this lens is wonderful and I highly recommend it. Rated 3 out of 5 by Angel from Sharp and fast... until it stopped working. This is the first lens I ever had to return to B&H. The second unit (replacement) just stopped focusing after four months of light use. I sent it to Sigma for repair under warranty. Second problem is also with the autofocus. I had to push the micro adjustment on my Canon 80D to the maximum at both ends of the zoom (18mm and 35mm) in order to get it to focus right. Any more correction and it would not have worked. 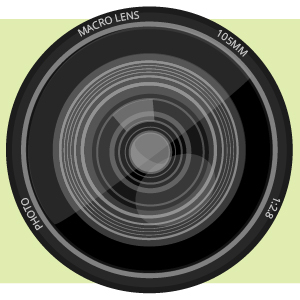 If you are not familiar with the procedure for micro adjustments or your camera does not have the feature, forget about this lens. You HAVE to do it and make sure you select and de-select it every time you change lenses. Rated 5 out of 5 by John from AMAZING LENS FOR VIDEO!!!!! This is a very versatile lens that offers a wide variety of filming options. The zoom is fantastic and smooth, and the focus is very precise. The best part about the focus is the range is wide, so you have the ability to be quite precise. The depth of field is shallow and creates a wonderful effect when pulling focus, but it opens up when doing a long/wide shot so it is easier to get a group or large object into focus. The construction is solid and durable. This is the lens to get if you are new to shooting video. I am not a photographer, so I can not comment on that. But I would imagine you would get great results with photography as well. Rated 5 out of 5 by David S. from Not just hype My main use for this lens is to do video work, some landscape and street photography with a 7D MKII body. The sharpness of this lens is unbelievable, it puts my Canon L series 24-105 to shame plus has a much faster aperture! Two of the most common criticisms for this lens are its weight and autofocus issues. It isn't a light lens but that's not a deal breaker. It doesn't weigh a ton either. As far as autofocus, I mostly use manual even when doing stills. Though I did give the AF a go and had no problems, even in low lighting to nail the focus. This lens has convinced me that Sigma is a solid purchase for a much better price than comparable Canon glass. Rated 5 out of 5 by Gopikrrishna from Sharpest lens I have experienced I have realized what I have been missing since I got hold of DSLR. I had been wondering what difference does the lens make going from $ lenses to $+ lenses when every photographer in youtube points out. The photos taken from this lens is very sharp. Build quality is top notch. I was using 18-105mm Nikon earlier, i end up zooming in each photo. This Sigma 18-35mm is not a lot of zoom but makes you to move and use different perspectives which is important in photography. 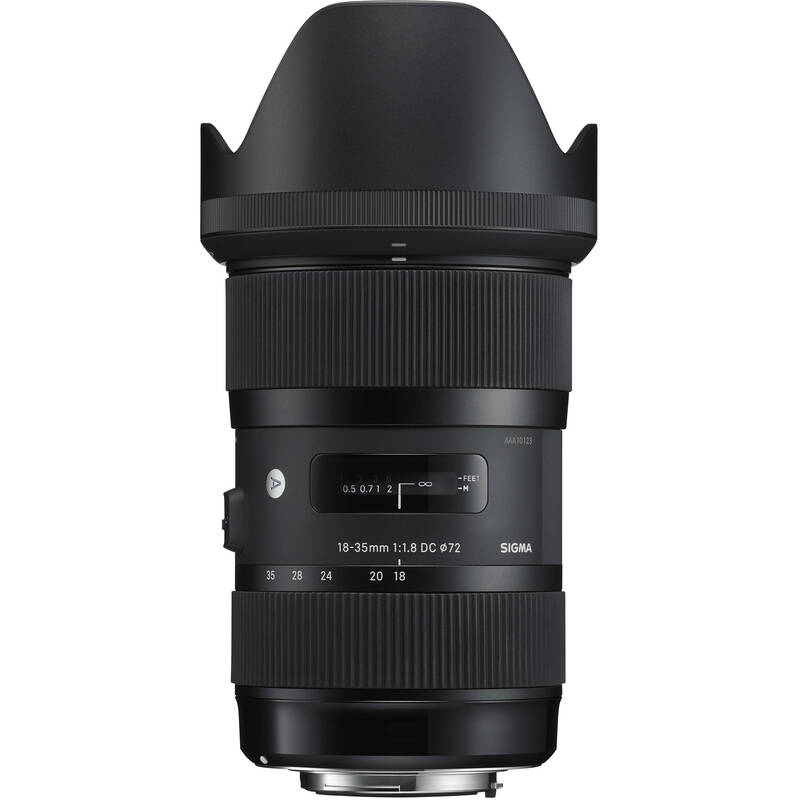 Long time amateur photographers having basic lens for so long and want to upgrade - this sigma 18-35 is the best. Just try it, you will love it.This lens is worth every $. Rated 4 out of 5 by BumKi C. from Love and hate What can I say? I love the built quality, the image it produces, best zoom lens in low light situation, great for wedding, awesome for video. I love this lens. However, I hate the inconsistency of its focusing with my 7D. I am not sure, but I wonder it's because of the contrasty nature of this lens, the camera thinks its in focus when it's not. That's just my theory. Its focusing works more consistently when your subject is closer, which is 95% of the situations I would use this lens for. If you, however, are having difficult time with its auto-focus, then use it in liveview mode, so far I have got 100% correct focus with lens in liveview mode. Rated 4 out of 5 by Corey from GREAT GLASS! 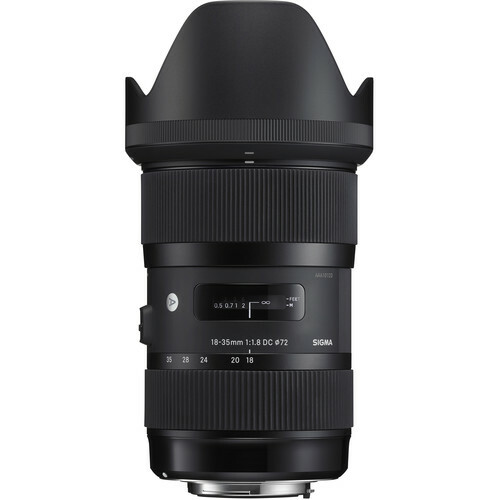 HOWEVER, BEWARE Now I want to start this review off correctly, this is a Sigma Art Lens, so, naturally, it creates stunning visuals and is a tank. It's a bit big, especially if you're putting it on any Sony (a7s, a7r, a6300, etc.) or Canon, or in my case the BMPCC. I'm using it with my Hoya UV IR 82mm filter along with my Genustech 82mm Eclipse Nd Fader Filter (Variable ND) and it seems to output some great images. Crip and I haven't noticed any vignetting with the filters on. All around, I think it's a solid piece of glass and if you are needing to zoom quickly for docs, weddings, or live events, I'd recommend using this alongside the Art 18-35mm f/1.8. Rated 5 out of 5 by Melanie from Perfect for low light shots of grandchildren I bought this lens December 2014 because my Canon 50mm F1.4 was not wide enough to photograph my grandchildren inside. I purchased this lens because of the wide 18mm and the F1.8. I love this lens. It is crisp and sharp. It lets me get great shots of my grandchildren, et al, in low light. It has great bokeh. I can get a lot closer to small subjects (flowers and insects) than I can with the 50mm F1.4. It is heavy. It does not have image stabilization, but the heaviness helps me to hold it steady. (I have trouble holding the 50mm F1.4 steady because it is so light.) I love it for macro shots, low light situations, and active grandchildren! Can this be mounted on old Nikon D40X? Yes, the Sigma 18-35mm f/1.8 DC HSM is compatible with the Nikon D40X. Does it autofocus on NIKON D750 when shooting a video? Yes, this lens will autofocus while shooting video on a Nikon D750. Hi guys Do you think it is a good idea to buy this lens for Nikon D7100 camera for travel &amp; landscape photography? This lens is an F-mount. I'm curious if this is compatible with the Metabones Nikon G Lens Speed Booster to attach to a Panasonic GH3? (The F and G is what confused me)Thanks! Yes, this lens will be compatible with the Metabones Nikon G Lens Speed Booster to attach to a Panasonic GH3. Nikon G lenses are still Nikon F-Mount; the G letter designation indicates that the lens has no aperture control ring and is designed to be used with cameras that allow setting the aperture from the camera body. G lenses also provide Distance information to the camera. Will this work with a Nikon D90? Yes. This lens is designed for DX (APS) sensor Nikons. will this work on d5200 and d5300 nikon? Yes, the Sigma 18-35mm f/1.8 DC HSM Lens for Nikon is compatible with both the Nikon D5200 and D5300 DSLR cameras.